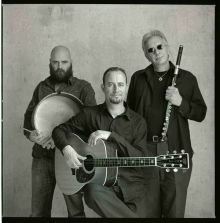 The band is acoustic and the music is inspired equally by the driving rhythms of Celtic music with the freedom and spontaneity of jazz. Founded in New York in 1984 and reformed in Dublin, Puck Fair mainly plays original music by Brian Dunning as well as music by such artists as Van Morrison and John Coltrane. Dunning has a breathtaking command of the flute, coupled with a most personal approach to jazz improvisation and traditional music. He returns here to the repertoire of one of his most successful projects, bringing him together with the versatile guitar of Sean Whelan, the infectious grooves of percussionist Robbie Harris. Puck Fair released an album in 1987 on the Lost Lake Arts label called 'Fair Play' with Brian Dunning, Tommy Hayes and the late Mícheál Ó Domhnaill. Robbie Harris bodhrán and percussion.